The safety of ships in adverse conditions is of upmost importance however the recent introduction of ship fuel efficiency regulations has led to concerns regarding the ability of ships to manoeuvre in adverse conditions at reduced power. This has led to the EU funding a project under the FP7 framework which aims to investigate these concerns, and amongst other tasks, to develop approach for realistic prediction of ship manoeuvring performance. The Department of Naval Architecture, Ocean and Marine Engineerin g is heavily involved in this project. 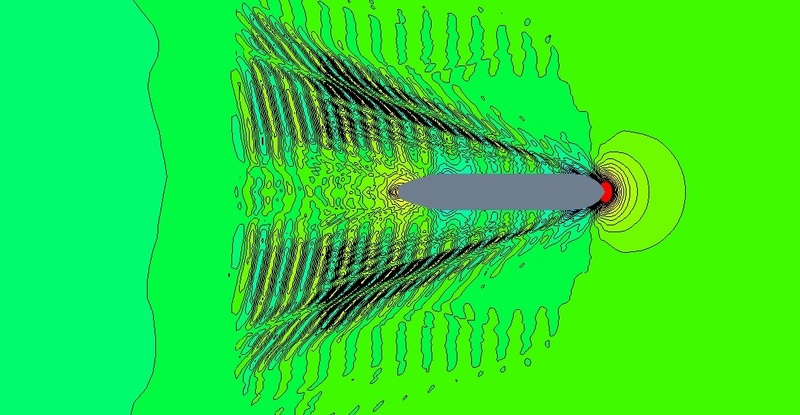 The ARCHIE-WeST facility is enabling complex CFD simulations to be carried out, in order to develop suitable approaches for the prediction of ship manoeuvring performance without the need for expensive and time-consuming model tests. Current prediction results have shown good agreement with experimental and theoretical results, and are capable of providing significantly more information that would otherwise be possible. Fig. 1 shows the predicted wake of a vessel which is free to sink and trim, generated as part of these activities. The HPC facility has also allowed for the use of overset meshes to simulate a vessel carrying out a turning circle manoeuvre, which is a relatively new technique in the field and would not be possible using typical hardware. This research has already given rise to two conference papers, and will continue to contribute to current knowledge over the completion of the EU project. For more information about the project contact Dr Paula Kellett (paula.kellett [at] strath [dot] ac [dot] uk) or Prof. Osman Turan (o.turan [at] strath [dot] ac [dot] uk) at the Department of Naval Architecture and Marine Engineering at the University of Strathclyde.